Have you made soft pretzels yet? You must!! They’re fabulous. So fabulous that ours are almost all gone!! Last night we had the most brilliant and amazing dinner. I’m not sure what one is SUPPOSED to eat soft pretzels with, but we had them for dinner. To go with roasted chicken thighs, we had zucchini fritters, stir-fried beet greens and oven-roasted fennel all made from vegetables that had been harvested the day before. And soft pretzels, of course. LOTS of soft pretzels, still warm from the oven. Sometimes with butter, sometimes on their own, sometimes to catch sauce lingering on the plate. And just in case this wasn’t enough, we rested the chicken and fennel on a sauce made from reduced chicken stock. Oh my. Why on earth didn’t I pay closer attentions to the more organized BBBabes who made soft pretzels earlier. They did say they were delicious! I don’t remember if they said they were easy to make though. And they are. They are insanely easy. What?!! Today is the 15th??? I thought that Saturday was the 15th!! Oh oh…. Brrrrrr!! It’s cold in the house! And it’s far too early. I’m going back under the covers!! What a change from last week when it was around 25C in the kitchen. This morning it’s 14C in the kitchen. So, I turned the light on in the oven, put the kettle on to warm the water and at last began to mix pretzel dough. 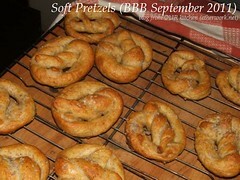 The only major difference between the MyRecipes Soft Pretzel recipe and mine is that they called for 3 1/4 cups flour. I found that I only needed 2 1/2 cups of flour, and I was careful to measure by spooning the flour into the measuring cup. Not really paying attention, I dumped in 3 cups of flour. Oh my!!! What a stiff dough!! (Hmmm, did Ilva also mention the same thing???) So I add some water. Pretzels are made from white flour and made into either a soft bread-like version or a hard, crisp variety. […] Pretzels are often topped with coarse salt before baking and occasionally other toppings are used, such as sesame seeds or poppy seeds, especially for the larger soft pretzel. Even though I saw that it was supposed to be white flour (still no clue about whether it should be high-gluten or not), I couldn’t help myself from using some whole wheat as well. Hmmm, not really much activity in there. The dough looks about the same size. I turned it a couple of times anyway and was relieved that it felt soft and smooth. Still on the stiff side though. Thank goodness. The dough is starting to rise. Maybe we WILL have pretzels tonight after all. I decided to divide the dough into 16 rather than 12. And I had no problem getting the dough out of the bowl. (I just can’t figure out why so many instructions say to oil the rising bowl.) And no problem shaping them either. I placed the shaped pretzels on parchment papered cookie sheets that I’d scattered cornmeal over. I loved watching the already boiling water foam up when I added the baking soda. Popping the shaped pretzels into simmering baking soda-ed water also went very smoothly. I really liked how they dropped down into the water and then popped up. And they really puffed up!! Ooops!! I see that I was supposed to use cooking spray on a rack to store the par-boiled pretzels. I’m afraid that I just placed the par-boiled pretzels back on the parchment paper. The parchment paper that no longer had much cornmeal on it. I’ve never been a fan of egg washes so I used a milk wash instead. Then I used a spoon to sprinkle on coarse grey seasalt. Oops. Another mistake. I switched to spooning the salt into my hand and using my fingers to put the salt on. I sure hope the first ones are not too salty. About 12 minutes ago, I put the pretzels into the oven. Worried about burning, I set the timer for 10 minutes. When the bell rang, I looked. They weren’t even close to being done. They appear to be in a state that would NEVER turn a dark golden brown. I set the timer for another 10 minutes. Rrrrrr, I hope we don’t have to switch to having couscous instead of soft pretzels with tonight’s dinner! They’re done!! I’d like them to be a bit more golden but they’re definitely done on the bottoms. I couldn’t help myself from breaking one of the smaller ones to taste it. Fabulous!!! I love soft pretzels and can’t wait to eat more! I’ll put the couscous away for another day…. Mixing: Whisk yeast in the warm water until the yeast dissolves. Add the sugar, flours and kosher salt to the liquid and using a wooden spoon, stir until the dough pulls away from the bowl and the flour is pretty much encorporated. This is quite stiff dough. Cover and set aside to sit on the counter for about 20 minutes. After 20 minutes has passed, turn the dough out onto the board. The dough is so stiff that you probably don’t need to dust the board with flour. Kneading: Wash and dry your mixing bowl. This prepares the rising bowl AND gets your hands clean. Knead the dough for about 10 minutes . As you knead, use a dough scraper to scrape up any dough that is on the board so the board is always clear. Knead until the dough is smooth and silky. Put the dough into the clean mixing bowl. Cover and allow to rise in a no-draft area til it has doubled (I put it into the oven with only the light turned on). When the dough has doubled, you can either gently push it down and allow it to rise again, or you can shape the dough. A good way to tell if the dough has doubled is to wet your finger and poke a hole in the top of the dough. If the hole fills up, it hasn’t risen enough. If there is a whoosh of air and the dough deflates a little, it has risen too much. If the hole stays in exactly the same configuration and the dough remains otherwise intact, it is ju-u-st right. Shaping: To shape the pretzels, turn the dough out onto a very lightly floured board. Divide the dough into 12 or 16 even pieces. Shape each one into a long rope – about 18 inches (~45cm) long. With each rope, form a circle with tails (sort of like a badly form Q). Twist the tails and fold them back inside the circle, pressing down to seal the ends of the tails to the edge of the circle. Lay the shaped pretzels on a parchment papered cookie sheet. Cover and allow to rise for 10 minutes (don’t worry if they don’t appear to have changed much). par-boiling Pour 6 cups water into a large non-reactive pot (I used our stainless steel stock pot). Cover and bring the water to a boil. Add baking soda so you can have fun watching it foam. Turn the heat down to simmer. Gently lower a pretzel into simmering water mixture and watch it sink to the bottom. When it pops up, turn it over with a slotted spoon and allow it to cook another 15 seconds or so. Transfer the pretzel to the parchment papered cookie sheet (if you are clever, you will have scattered cornmeal before putting the parboiled pretzel down). Repeat with all the other pretzels. Make sure they are well separated. You may have to use two cookie sheets. 1.) Water: Under no circumstances do I ever use water from the hot water tap. Water from the hot water tap sits festering in the hot water tank, leaching copper, lead, zinc, solder, etc. etc from the tank walls… the higher temperature causes faster corrosion. Of course, saying that it is unsafe to use water from the hot water tap might be an urban myth, but why tempt fate? I heat the water in our kettle. A pretzel is a type of basic bread native to Germany that is easily identified by its traditional twisted knot shape that resembles two crossed arms within an oval. In much of northern Europe, this shape is often used as a symbol to signify a bakery. Pretzels are made from white flour and made into either a soft bread-like version or a hard, crisp variety. The soft pretzel is usually larger than the harder version and is often served with mustard or cheese and is eaten as a snack with beer. Hmmm, as a snack with cheese and beer, eh? Perhaps this is what we’ll do with the few pretzels that are still left. Or not. Pretzels are awfully good with dinner…. For September let’s gather around the kitchen table as the fabulous Bread Baking Babes delve into the past…610 AD in fact…and we can decide if we believe that these bread morsels were used by monks of that time to teach little boys to pray or to reward them for staying quiet during Mass…or both. That’s the story behind Soft Pretzels, called Bretzels in German. The traditional shape resembles hands folded in prayer. Even if it isn’t true, it’s true that soft pretzels are a county fair and mall favorite snack food. I’ve included directions for the traditional salted soft pretzels and for the more contemporary cinnamon sugar ones. However you flavor them, they give you a chance to have fun shaping the dough. I considered coating some of our pretzels with cinnamon sugar but decided that we already had jam tarts for dessert so just made savoury pretzels. You might decide differently… please bake along with us and receive a Baking Buddy Badge to display on your site; bake soft pretzels and post about them (we love to see how they turned out AND hear what you think about them) before the 29 September 2011. If you don’t have a blog, no problem; we still want to see and hear about your bread!! Thank you, Elle! We love soft pretzels! I’ll definitely be making these again. On Friday (not the 14th), we drove north to our friend’s farm to get two dozen eggs from her and suddenly, we found that we had two GIANT bags of salsify, yellow and red beets with the most amazing lush greens, green and yellow zucchinis, an English cucumber, leeks, spaghetti squash, butternut squash, delicata squash, pattypan squashes, jalapeno peppers and a rather large fennel plant (it was the smallest one!!) in the back of the car. Laughing and yelling many thank-yous, we escaped before our wonderfully generous friend could slip any more vegetables into the car. This entry was posted in baking, BBBabes, bread - yeasted & unyeasted, bread recipe, food & drink, posts with recipes, PPN; YeastSpotting, MLLA, Bookmarks; T&C on Sunday, 18 September 2011 by ejm. What a great fun write up. They are insanely easy and insanely good. Ireally need to do a batch with rosemary and roasted garlic in the dough now. Yes, rosemary and roasted garlic for one batch…and some flax seed, too…and another batch with orange zest and honey for the sweet tooth…dipped after baking in butter and then orange zested sugar. Ack.. roasted garlic? Come again? There is some serious thought going on in my head now…. They do sound sinfully delicious…. and have been added. Now, if you would just send me some. Oh, wait… You ate them all, didn’t you? !